Brandywine Branch Distillers has launched The Revivalist Gins, a four-strong small batch grain-to-glass portfolio designed to reflect the seasons of the year. 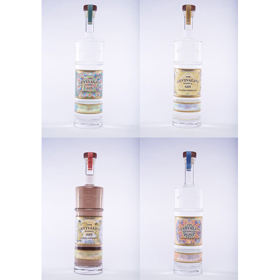 The Revivalist Gins comprises four expressions: Equinox, Summertide, Harvest, and Solstice, and represent the inaugural portfolio from new micro distillery, Brandywine Branch Distillers, located in Pennsylvania’s Chester County. Designed to be enjoyed in cocktails as well as sipped, the gins are not intended to be enjoyed only in the season after which they are named, but rather offer a year-round flavour spectrum that “echoes the natural progression of the seasons”, to offer something for every palate. Distilled entirely on site under the eye of managing director of production and master blender at Brandywine Branch Distillers, Rhiannon Walsh; each gin expression is created from barley, wheat grains and botanicals, and has a foundation of juniper, angelica and coriander. Equinox has notes of citrus mélange, a touch of mint and meadowsweet and hyssop to finish, while Summertide offers jasmine, rose, meadowsweet and citrus. Harvest offers tastes of lemon, nutmeg, cinnamon, elderflower, orange and clove; while Solstice has notes of dried cherry, anise, orange peel and ginger, and is barrel rested in French Oak Barrels that formerly held red wine. Brandywine Branch Distillers has also planted an orchard of apple varietals for use in future brandies, as well as to create an apple-based mash for other spirits to be released down the line, and juniper bushes have also been planted as part of the site’s Juniper Revival Program. A selection of single cask Bourbons will also be introduced in limited quantities as each barrel becomes ready for bottling. The distillery also intended to open a farm-to-table Brandywine Branch Bistro, and offer distillery tours and various masterclasses.. The Revivalist Gins can be purchased at the distillery and through the distillery website as well as in restaurants and bars in Pennsylvania. They are also available at retailers detailed online at www.brandywinebranchdistillers.com. The suggested retail price is US$39.99-$49.99. Id like to comment that The Revivalist GIns are also available WIDELY, both on and off premise in New Jersey.